Published: Dec. 1, 2012 at 04:03 p.m. Updated: Dec. 2, 2012 at 12:24 a.m. 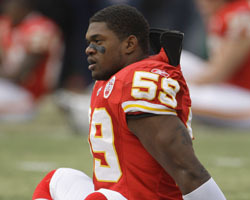 The Kansas City Chiefs will play their Week 13 game as scheduled Sunday after the suicide of linebacker Jovan Belcher. The Chiefs released a statement confirming the decision. "After discussions between the league office, head coach Romeo Crennel and Chiefs team captains, the Chiefs advised the NFL that it will play tomorrow's game vs. the Carolina Panthers at its originally scheduled time," the statement read. It was reported earlier Saturday that the NFL had advised the Panthers to travel to Kansas City as originally planned. The teams will play Sunday at 1 p.m. ET. There had been speculation that the game could be postponed, given the tragic events that unfolded Saturday morning. Belcher, a fourth-year linebacker for the Chiefs, shot and killed his girlfriend before shooting himself at the team complex at Arrowhead Stadium. Police say Chiefs coach Romeo Crennel and general manager Scott Pioli spoke with Belcher at the facility before he fatally shot himself as police arrived at the scene.